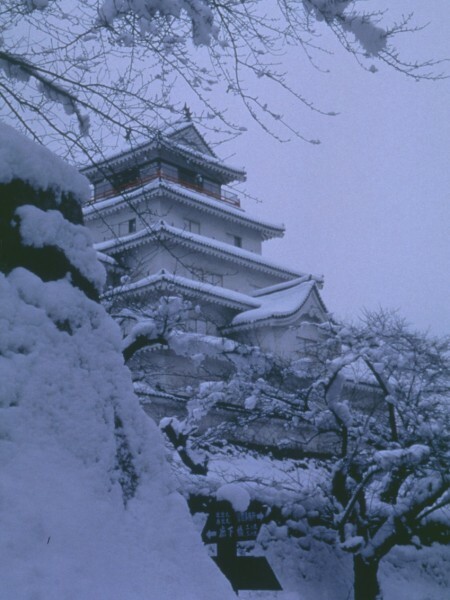 Aizu Wakamatsu Castle is classified as a hilltop castle (its layout: Teikakushiki), and is located in Fukushima Prefecture. During the pre-modern age, it found itself within the borders of Mutsu Province. It is associated with the Gamō, Matsudaira (Hoshina) clans. Dates in use: 1384 - 1874. This castle, known more commonly to the locals as Tsuruga castle, was once the strongest in the Tōhoku area. It was laid siege to in the Boshin War of 1868 & after a month the occupants surrendered. Today we can see many rebuilt structures including the main tower, the Kurogane Gate, the Hashii Turret & two long, connecting turrets. 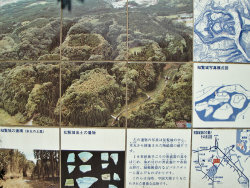 The layout of the defensive enclosures (apparently modelled after Toyotomi Hideyoshi's version of Ōsaka castle) remain more or less intact. The same cannot be said for the turrets & gates that once stood in them though. 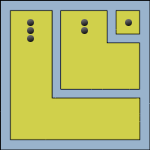 Weaving their way through these enclosures are well-defined, water-filled moats. During dismantling of the castle in the late 1800's, the three-story turret of the main enclosure was transferred to the Amida temple. Grafted onto this turret is the Chinese-style, Kara-hafu-no-genkan, the entrance foyer of the Daisho-in (the castle's main administrative building). 1384 The castle was built, at this time though it was known as Kurokawa Castle. 1589 Date Masamune fought the Ashina clan & gained possession of the castle. 1590 Possession of the castle was relinquished to the Gamō clan at the order of Toyotomi Hideyoshi. 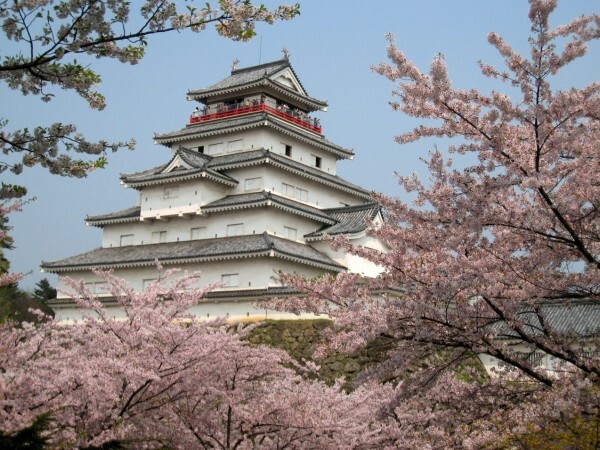 1593 The castle was expanded upon complete with a seven-story main tower and renamed Tsuruga Castle. 1589 Uesugi Kagekatsu was stationed here. 1601 Once again the Gamō clan were stationed here. 1611 The main tower was damaged due to an earthquake. 1627 The Katō clan of Iyo, modern day Ehime, were stationed here. 1639 The seven-storied, five-layered main tower that the Katō clan had transported with them from Shikoku was erected & the outer defenses expanded upon. 1643 Masayuki of the Hoshina clan was stationed here. 1868 After a month long siege against Imperial forces, the castle's lord, Matsudaira Katamori, surrendered. 1874 The castle was decommissioned. 1900 The site was sold to the former lords of the castle, the Matsudaira clan. 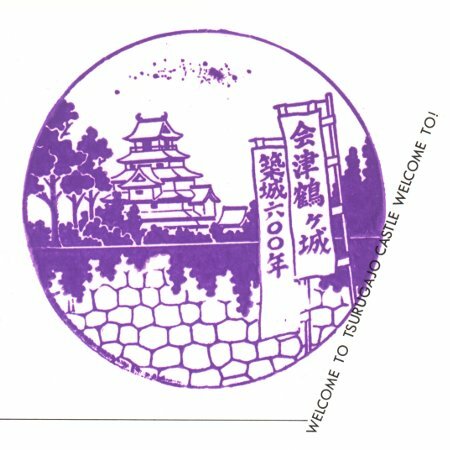 1927 Ownership was transferred to Wakamatsu city. 1965 The main tower was rebuilt using concrete. 2001 The Hashii Turret & the Minami Hashiri (a long hall-like building connecting the Kurogane Gate & the Hashii Turret) was rebuilt using wood. Unusually, they sport red roof tiles. 2010 A restoration of the main tower commenced. The colour of the roof tiles will be changing to red.